Diving in Cozumel you know you’ll enjoy encounters with a wide variety of species: moray eels (green, spotted and golden), nurse sharks, turtles (hawksbill and loggerhead), huge lobsters, and giant barracuda, just to name a few. 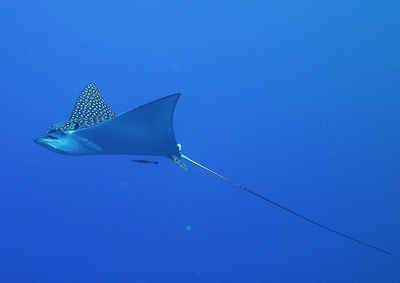 But my favorite critters on my wish list are always the spotted eagle rays. Watching one blot out the sun as it soars overhead or glides gracefully beneath you during your safety stop is a heart-stopping moment. Seeing just one or two eagle rays during a dive trip is a treat. I had always wanted to dive Cozumel’s Eagle Ray Alley, ever since I heard about the schooling eagle rays that gather at the northern end of the island during the winter months. No one knows where the rays go for the rest of the year, but they arrive in Cozumel every November and hang around through March. So on my recent March visit to Cozumel dive buddy Fulvio arranged a trip with Papa Hog’s dive operation to visit the eagle rays. Early one morning we left Papa Hog’s dive shop, located next to the Villa Blanca Hotel. 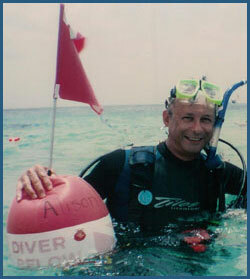 The day was sunny, not much wind and the sea calm – perfect dive conditions. Passing the cruise ship pier, our dive boat was dwarfed by the massive, sweeping black hull of the Disney Ship. We waved “Hi” to Mickey and kept on going. Then I looked ahead. 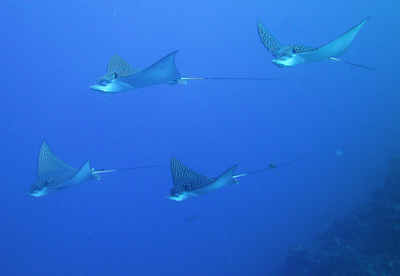 Five large eagle rays approached, like fighter jets flying a diamond formation. Fulvio swam up to me and we exchanged hi-fives. Soon, Eddie signaled it was time to surface. Because of the depth and effort dealing with the strong current this is a relatively short dive, usually 35 to 40 minutes. We ascended for our safety stop and three minutes later surfaced. Our dive boat was right there to meet us. We headed back to shore, a bunch of excited, happy divers. ← What Causes Abalone Divers to Die? Thank you for reminding me of how amazing these creatures are. I too was mesmorized when I viewed them a few years ago. Probably one of my most memorable dive experiences. Saw the giant mantas in the Maldives, but still, these guys captured my heart. Awesome video. We were at this exact spot in feb of 2013 and saw at least 50 rays. Long safety stop due to th time spent deep, but worth it!!! Nice video!! Cozumel is an amazing place to dive ! Full of wonderful creatures to spot. I agree, Eagle Rays are amazing creatures, full of grace. Thanks for your article and for sharing your personal experience. Wow. Beautiful photos. Nice one Paul. We’ve been back every year for the past 20 years, and have never been disappointed when looking for these beautiful and absolutely amazing creatures. Cozumel is the best!